Happy Birthday Tim Pflueger, San Francisco still loves you! After realizing late in the day on September 26 that it was architect Tim Pflueger’s birthday, I decided to walk within a short radius of my office downtown and photograph a few Pflueger buildings. The big reward while walking around on a lovely balmy evening was to see the newly renovated Telephone Building, now officially renamed 140 New Montgomery, all aglow with gorgeous flood lights shining on the tower, just as it did back in the day after the building opened in 1925. The current owners, developers Wilson Meany, recently finished a huge renovation and seismic retrofitting job. Yelp Inc. moved into several floors of the tower earlier this month, being the first company to occupy the building since AT&T moved out in 2006. 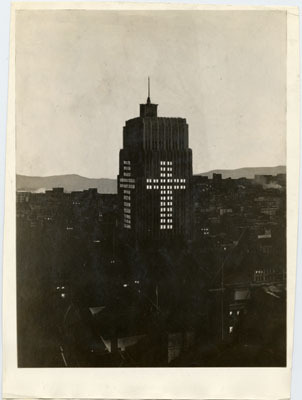 As you can see, from this 1929 photo, the building used to have many floodlights highlighting the tower, and at Easter, Pacific Telephone had lights in the windows lit to form the shape of a cross. New Montgomery Street is lively with lots of activity going on, due to the heavy concentration of tech companies in the area. I talked with a French entrepreneur who just moved to San Francisco to try to get his curation start-up company going, and he graciously contributed an excellent photo (see below) of New Montgomery Street. Other tech companies in addition to Yelp are moving into 140 too, including one named Terracotta (140 is finished with a white and grey speckled terracotta made by Gladding McBean). The 26-story building is now over 85% leased. Wilson Meany, the developers who bought the building from AT&T Inc. in 2007, are trying to be both energy efficient and good neighbors and currently are lighting up the tower from about dusk until 10 pm. It’s great to see the tower aglow. 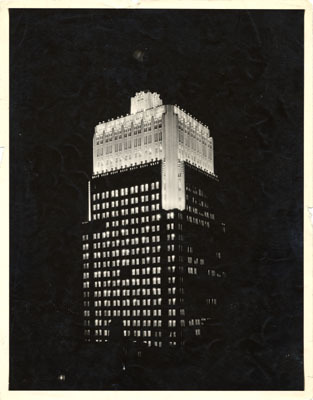 In February, 1926 the magazine “Architecture” wrote, “In the new Telephone building, San Francisco has her Woolworth tower.” I was reminded of that comment when I saw how stately the Telephone Building looks at night now, where past, present and the future all collide. Note: this post was not posted on Pflueger’s birthday because just as I was trying to proofread and post, Comcast started to do maintenance in my neighborhood and I lost my connection for the evening!